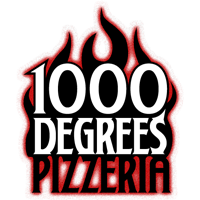 Reader Tom P. let me know about two celiac-friendly spots in Pitman: Mannino's Cucina Italiana (126 S. Broadway, 856-270-2352) serves two types of gluten-free pasta, and Alaura Kitchen (36 S. Broadway, 856-589-3845) offers Belgian-style frites from a dedicated fryer and five gluten-free dipping sauces. Many ice creams flavors there are also gluten free. Cake Stand in Voorhees (2999 E. Evesham Rd., 856-229-7384) will make gluten-free cakes and cupcakes by special order. Separate mixers and bakeware are used. The Hershey Company announced this week that it's extending its Kisses chocolate candy line with its new Kisses Deluxe confections. 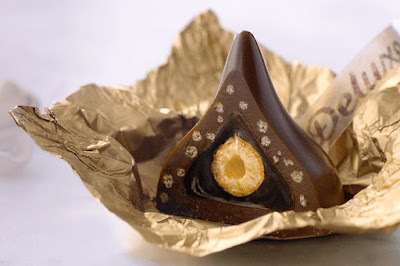 The deluxe version is double the size of traditional Kisses and will have a hazelnut center surrounded by gluten-free rice crisps. 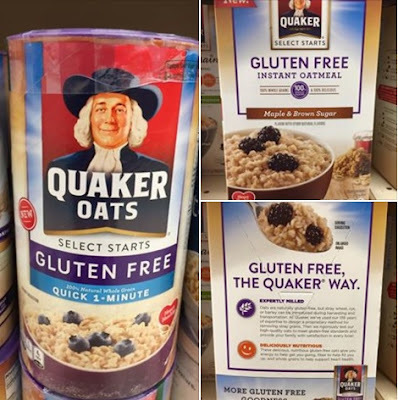 As I reported exclusively last month, Quaker planned to introduce gluten-free versions of its one-minute quick oats (sold in canisters) and instant oatmeal packets in Maple & Brown Sugar and Original varieties this fall. The products are making their way to supermarkets now, and based on the product packaging, the company is not utilizing pure gluten-free oats but instead is using a proprietary method for removing stray wheat, rye and barley grains. Quaker has not shared any information about the process, but it could be similar to what General Mills has been doing to segregate gluten in the production of certain Cheerios cereals. All of Ready Pac Foods' new elevAte single-serve salads are non-GMO, organic, gluten-free ready-to-eat superfood salad blends. The product line features eight recipes including Blu-Rugula, Go-Go-Gogi and Kale Caesar, as well as organic recipes like Organic Power Grains, Organic Nutty Cranberry and Organic Spinach Pow. The salads will be available for $4.99 each. Check your favorite liquor store for Spiked Seltzer, a new gluten-free beer that I reviewed in Tuesday's blog post.